Welcome to Judy Niemeyer’s Prairie Star/Hawaiian Star Technique of the Month Class!! The Prairie Star and Hawaiian Star are the exact same pattern with the exception of fabric color placement. You will be required to purchase the Prairie Star pattern (Hawaiian Star has been discontinued) for this class which will provide you with the instructions, foundation papers and templates needed to complete this quilt. If you prefer the color placement of the Hawaiian Star, I will provide you with a separate copy of the Hawaiian Star pattern instructions only, which will provide you with the fabric requirements for that specific layout in exchange for your Prairie Star instructions. You will still be using the foundation papers and templates from the Prairie Star pattern that you purchased. 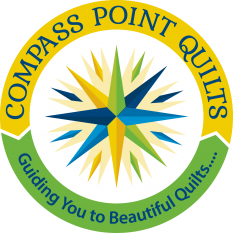 The decision as to which layout you will be doing needs to be made prior to purchasing your fabric and a request for the Hawaiian Star instructions can be made by contacting me at www.CompassPointQuilts.com. The Prairie Star/Hawaiian Star pattern was not originally written as a Technique of the Month pattern but has all of the elements a Technique of the Month quilt needs to give you a broad overview of the many techniques required to complete any Judy Niemeyer quilt. I have reviewed and organized the pattern into specific learning blocks and have attached a copy of the six month schedule. This schedule is broken down into AM & PM lessons for each monthly class and also lists specific homework that will need to be done by you to stay on track for a six month completion. Pre-cutting your fabrics on a monthly basis is a mandatory requirement of this course. If your specific pre-cutting isn’t done prior to each monthly class, you will spend most of the class cutting instead of sewing and it’s always more fun to be sewing in class!! Please begin preparing at least 2-WEEKS prior to the class to make sure that you are able to get familiar with your pattern and complete the required pre-cutting beforehand. We always recommend reading through your entire pattern several times before beginning. Fabric Selection: Please refer to the yardage chart on the back of your pattern for the required fabric amounts. Personal Note: I purchase an extra ¼ yard of each fabric I’m using just in case a mistake is made in the cutting, sewing or trimming process. Sometimes it’s hard to find a specific fabric after a period of time and if you find that you are in need, it’s great to have on hand. If you don’t need it, you can always add it to your stash! Choosing to do this is totally up to you. Background Fabrics (BG #1, BG #2 & BG #3); Accent Fabrics (A #1, A #2 & A #3); Dark Fabrics (D #1, D #2, D #3, D #4, D #5 and D #6); and Medium Fabrics (M #1, M #2, M #3, M #4, M #5 and M #6). If you are using the same fabric for different locations, mark all codes on the 3×3 post-it for that specific fabric. I realize that this seems like a lot of work, but this quilt will be worked on over a period of six (6) months and by labeling the fabric at the beginning, it will save a lot of time trying to figure out “which fabric goes where” four months into the project. Background Fabrics (BG #1, BG #2 & BG #3); Light Fabrics (Blue #1; Orange #1, Orange #2 & Orange #3 and Green #1, Green #2 & Green #3); Dark Fabrics (Purple #1 & Purple #2; Ocean #1, Ocean #2 & Ocean #3 and Jewel #1, Jewel #2 & Jewel #3). You can choose your own color-way for the Hawaiian Star, but please label the specific fabrics with the above codes because that is how the fabric is listed/referred to throughout the pattern. Example: If you choose three yellow fabrics in place of the orange fabrics you will still label them Orange #1, Orange #2 & Orange #3. This will save a lot of confusion later on. If you are using the same fabric for different locations, mark all codes on the 3×3 post-it for that specific fabric. I realize that this seems like a lot of work, but this quilt will be worked on over a period of six (6) months and by labeling the fabric at the beginning, it will save a lot of time trying to figure out “which fabric goes where” four months into the project. Color Chart: Prior to the first class, set up a color chart to match the fabric layout on page 19 of your pattern. You can follow the layout with the same number of fabrics or you can combine the fabrics. How you choose your fabrics is up to you, but if you do change your fabrics I would suggest you build another chart identical to the chart provided in the pattern. Paste your new fabrics over the boxes. Do not cover up the writing at the side of the boxes because the cutting instructions are written to correspond with the numbers listed at the side of each box. If you cover up the writing, you will not know which colors to use when you start cutting your fabric. Prepare Ziploc Bags: Prior to the first class, please label six (6) Ziploc bags (minimum size – one gallon) with the numbers 1-6 and bring them to class with you. Preparing your Foundation Papers: Please read over the section “Cutting and Preparing the Foundation Papers” on page 2 of your pattern. During the first class, I will show you a quick and easy way to trim these foundation papers with a 1/8” allowance. We will practice together on the papers you will need for the first day and you can complete the remaining cutting at home per the assigned homework schedule. Marking “Fabric Guide Lines” on Foundation Papers: Please read over the section “Dotted Lines” on page 2, lower left-hand column. I will demonstrate this step during your first class. We will practice on the papers you will need for the first days class and you can complete the remaining marking at home per the assigned homework schedule. This step helps you to locate the actual area that your fabric needs to cover before adding your fabrics. It takes a few minutes to complete this step, but it saves a lot of time when you don’t have to rip out seams when fabric has been miss-placed during the sewing process. Preparing Templates: This pattern requires both paper and plastic templates. Please follow the directions “Preparing the Templates” on page 2 and 3 of your pattern and complete this step prior to the first class. Plastic Templates: Adhere template #’s H-1, H-2, CS-1, CS-2, CS-3, CS-4, CS-5, RS-2, RS-4, RS-6, RS-8, RS-10 and RS-12 onto template plastic and trim around them on the solid black lines. Per pattern directions, place plastic templates into the appropriate Ziploc bag. Paper Templates: Trim around template #’s CG-1, CG-2, CG-3, RS-1, RS-3, RS-5, RS-7, RS-9, RS-11, RS-13 and B-1 through B-20 on the thick black border lines and per pattern directions, place them in the appropriate Ziploc bag. DO NOT CUT THE PAPER TEMPLATES APART AT THIS TIME! These strips are for the CS Unit. Please place all strips into Ziploc bag #3. After the first month, you will be cutting fabric each month for the next class. This will be listed on the attached class schedule under the homework section.